Trust me, when I say this photo (taken from Etsy.com) in no way does justice to ReAcoustic‘s totally acoustic iPhone speaker dock. Your read that right—totally acoustic. 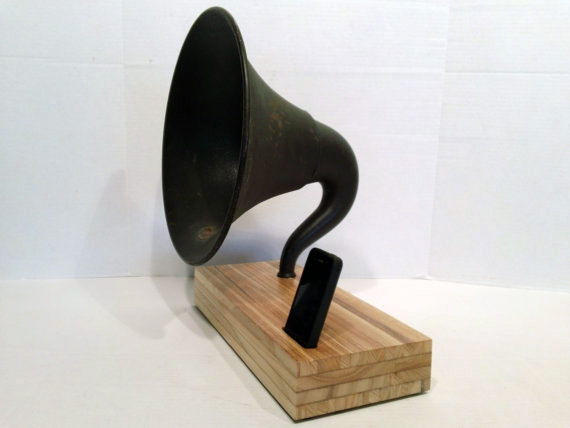 These incredible pieces created by Ryan Boase in South Carolina use old instrument or gramophone bells and recycled wood to project sounds from your iPhone (or Droid or iPad) without electrical cords or batteries or small hamsters running on treadmills. Flabbergasted? Click here for a demonstration of how it works. The piece pictured here is made with a vintage 14-inch Atwater Kent gramophone horn and costs $462. And if you live in Las Vegas, you can pick up pieces from ReAcoustic at my new favorite store, Artifact at the Market LV at Tivoli Village. Just be careful; if you’re anything like me, you’ll pretty much want to buy the whole store while you’re there.